At our house, seafood is usually served for lunch when it's just me and my tot, as Steve doesn't eat seafood. Dude, you're totally missing out! Well..more seafood for the rest of us! It was such a nice day to sit outside and enjoy lunch, I decided to make something quick and simple that doesn't require more than one plate. I love eating in the backyard but when I'm alone with my tot, bringing out more than one plate and a glass each requires too much work especially because we have a hyper dog who gets in the way jumping around once she finds out there's food going outside. My little helper helps me with the door and napkins while I get the food out, and that one trip is just enough. Pictures look a little gloomy as the sun suddenly went behind the clouds just as I was getting the camera out. And I am not a professional blogger who can afford to take photographs till she gets the perfect one as my tot would come on top of it already. Like so. No fork, no knife. The fastest way to get to the food he wants. He makes fun of me now. I gave him my old blackberry to play with and he aims at his cereal and says he's taking pictures of food and laughs. Back to the Fish, I like that it doesn't require traditional messy breading process. It's quicker and a little healthier. Crumbs straight on the fish then just bake! 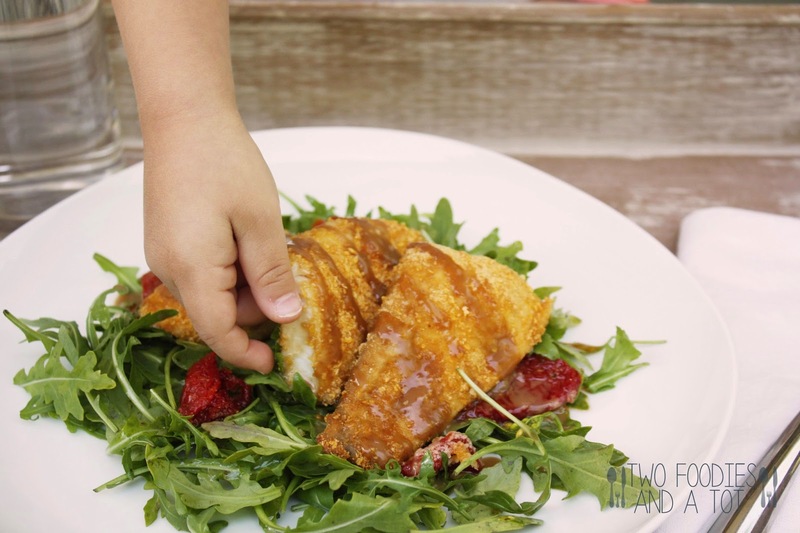 I love arugula salad so I simply tossed arugula and sundried tomatoes with white balsamic vinaigrette and served the breaded tilapia on top with the glaze. 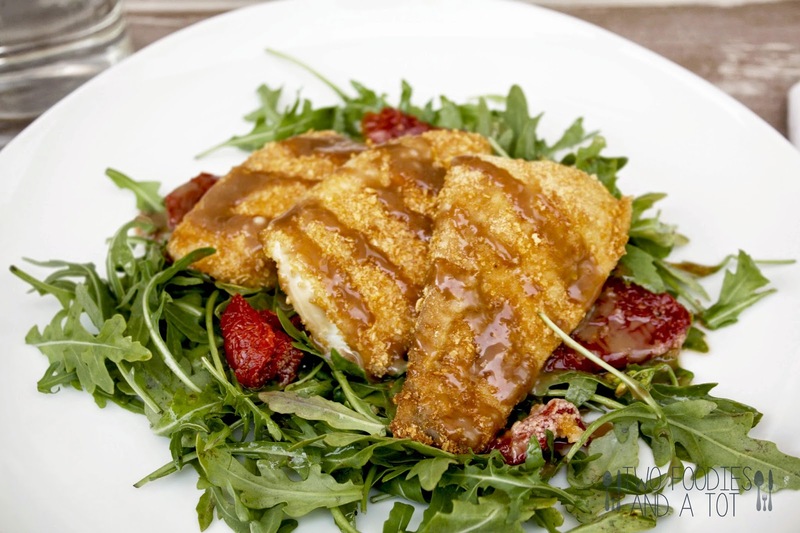 Glaze is very flavorful so you will enjoy it better if you use subtle flavor to your bed of salad. Adapted from ohsweetbasil. 1. Preheat the oven to 400F. Spray a baking pan with oil spray. 2. Add cornflake crumbs to a shallow dish and coat the fillet, pressing down. 3. Place the fillet on the pan and drizzle with olive oil. 5. Meanwhile, make the glaze - mix all the glaze ingredients and whisk. 6. 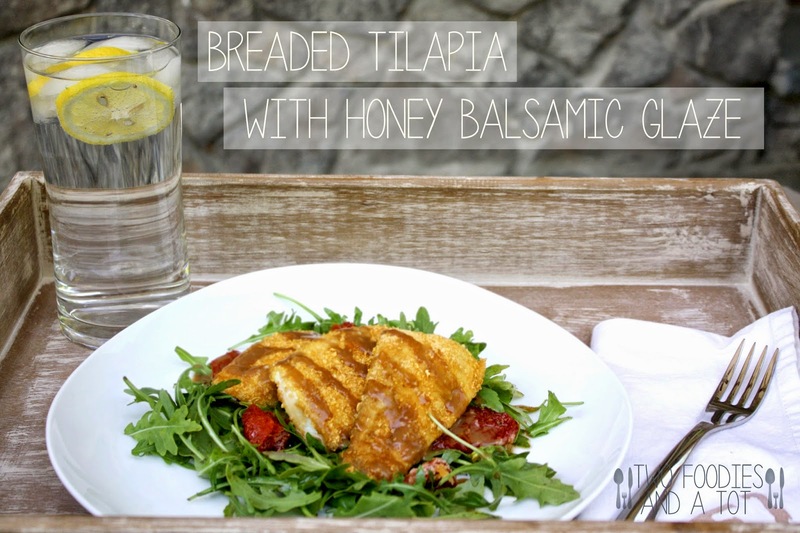 Serve it with salad and drizzle the glaze on top.